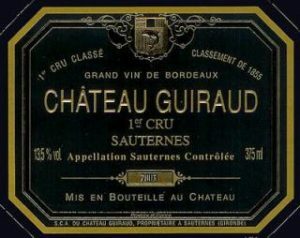 As Bordeaux presents the 2018 to the world this week, I take a look at how the identities of some of the Chateau ‘Brands’ continue to evolve. Visiting the Châteaux in Bordeaux you can’t help but notice the increasing number of vats in the cellars and their decreasing size. This directly reflects the more precise parcel (or plot) divisions within the vineyards. Alongside new, more precise, selection techniques at harvest, this gives winemakers a larger palette of wines to work from to create their blends. 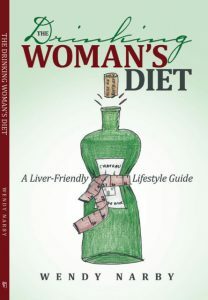 Second wines are nothing new, third wines are now more common but this proliferation of labels from individual properties poses the problem of how to differentiate between them in the eye of the consumer. How can winemakers create new products and grow their brand whilst maintaining brand recognition and without creating confusion or alienating established clients, both trade and consumer? It’s not always easy. Take the Rothschild brand. How many times have consumers been confused about the mention of Rothschild on a label? Outside of the kissing cousins of Lafite and Mouton in Pauillac, both branches of the family have a range of other labels from outside these iconic vineyards. Mouton Cadet is the largest and most famous but the Saga, Réserves and Légende ranges from the Lafite stable are growing and that’s without looking at their ranges from the Languedoc and further afield. Is Rothschild perceived as a brand or is it a signature guaranteeing a level of quality? I know from experience that many clients are proudly buying into the dream when they bring out a bottle with a Rothschild signature. Labels change, with properties tweaking the design over the years. Mouton is famous for changing artists with every vintage, but here I’m talking about more subtle changes in labels. Why change? They could be looking for a more modern appearance to attract a different market, it could be a change of ownership or a change in wine making style. 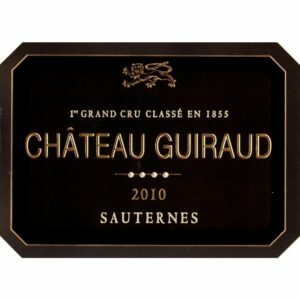 An example close to home is Chateau Guiraud; the maritime history of the Narby family was the inspiration for the use of the dolphin on the label. The second wine being called Le Dauphin (also French for the ‘King in waiting’). Under the new ownership of Peugeot this has been replaced with a Plantagenet lion, a reference to the Alienor of Aquitaine but not too estranged from the carmakers’ logo. The name itself might pose a problem. In export markets a pronounceable name is important and a non-threatening name helps when ordering from a wine list. 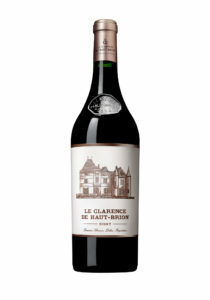 This could be one of the reasons why the second wine of Chateau Haut Brion was changed from Château Bahans Haut Brion to Le Clarence de Haut Brion with the release of the 2007 vintage. Not only a new label but also presented in the unique Haut Brion shaped bottle, reinforcing the brand recognition. Similarly the second wine of Château Lynch Bages called Haut Bages Averous had very little in its name to suggest a link to its famous big brother. It was changed to Echo de Lynch Bages in 2008. 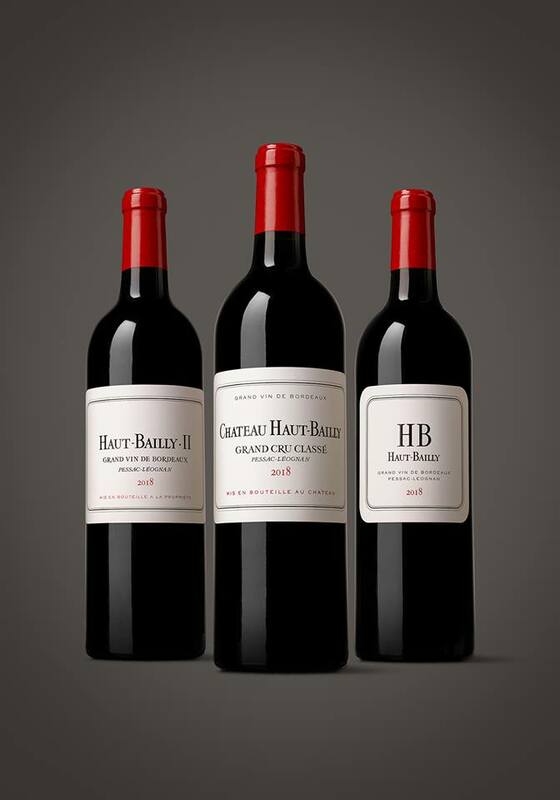 Chateau Haut Bailly has just redesigned their labels keeping the design in line with the very classic image of the estate. The chateau introduced their second wine in 1967 under the label La Parde de Haut-Bailly. After 50 years it has been rechristened simply Haut-Bailly.II for the release of the 2018 vintage. 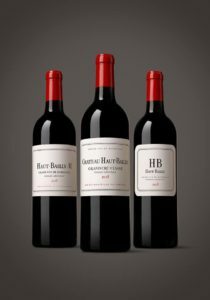 Their third label, known as “Pessac-Léognan” since 1987, is now labelled simply with the HB initials of the property. All three labels have a unifying clear, modern and elegant brand identity, very much reflecting the style of the wines and the chateau. Other properties take a less classic approach, Philippe Raoux purchased Chateau D’Arsac, Cru Bourgeois of Margaux in 1986 and he has been innovating (and renovating) ever since. He shares his passion for contemporary art throughout the chateau, cellars and vines adding a new major contemporary piece of art every year since 1992. The chateau itself is a work of art; the fire-damaged roof has been replaced with a glass tiles letting light down through the centre. The uninitiated might think a girder was left by the work men leaning against the building, but no, it is another work of art now so intimately connected with the property that it graces the labels. The chateau already produced three wines, Chateau d’Arsac appellation Margaux, Le Monteil d’Arsac appellation Haut Médoc, (the property has vines on both appellations) and a white Bordeaux. He also produces a wine makers collection – handing over part of his grapes and a corner of the cellar every year to a visiting wine maker. The 2018 vintage sees the arrival of Raoux’s new baby: Le Kid d’Arsac. This is a second label from the Margaux appellation and true to his artistic and slightly irreverent style the label is a hand drawing of the big brother’s label featuring the iconic chateau outline and the infamous girder. 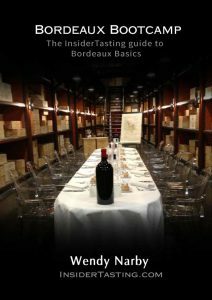 Not having enough wine to supply demand might sound like a nice problem to have, but frustrating, especially in a small and prestigious appellation such as Pomerol. Chateau Clinet faces such a problem, unsurprising really, given the success of their wines under the dynamic Ronan Laborde. In 2009 he repeated the 100 Parker point achievement of in 1989 by the previous owners (could this be a series – we are now in 2019?). How to satisfy demand without diluting the brand and, more importantly, the quality? As well as Le Grand Vin, Chateau Clinet traditionally produced a second wine Fleur de Clinet. Improvements in the vineyard saw more grapes destined for the Grand Vin, reducing production of the second wine, yet the demand was there, what to do? 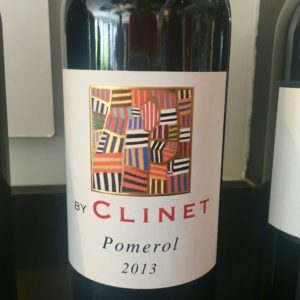 The answer was to create BY Clinet with a different philosophy to a classic second wine, sourcing grapes from selected growers (including Clinet) across the classic Pomerol terroir. The wine is made by the Clinet team with aging in second-fill bar­rels putting an emphasis on freshness. The presentation is distinctly different, with a painting by the American artist Gordon Hopkins gracing the label – so no confusion there. The first vintage of By Clinet label with its very distinctive label. Ronan already introduced the notion of a Clinet brand in 2009 launching Ronan By Clinet. Here the same wine making team (he keeps them busy) produces a more accessible, Merlot driven wine, from grapes purchased from other vineyards on the right bank appellations of Castillon-Cotes de Bordeaux, Bourg-Cotes de Bordeaux and Bordeaux. The result is a Bordeaux AOC with a Pomerol feel. In 2012 he added a Bordeaux dry white to the brand with grapes selected from vineyards in the Entre Deux Mers. Now he has added his Pur’Cab Bordeaux, a 50:50 Cabernet Franc and Cabernet Sauvignon blend, a change in tack from his usual Merlot signature. It’s a tiny production, just 1 000 cases, so far only available in 2015 and 2016 vintages. So successful have these brands become they have outgrown the original wine cellar at the Château. 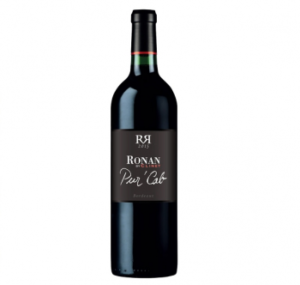 Ronan and his team now make these wines in their ultra modern wine cellar, opened in time for the 2015 vintage, a stone’s throw from where the Grand Vin is still produced at the Chateau. 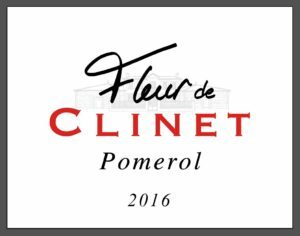 The latest news is that Château Clinet will add to their ‘Clinet Collection’ towards the end of the year, re releasing the Second Vin, La Fleur de Clinet with a tiny production of the 2016 vintage. Sneak preview of the label project below – you heard it here first! The project for the new Fleur de Clinet label – watch this space. If you enjoyed this post you might enjoy A New crop of Labels and the update on Les Griffons Label here .